Every reluctant reader is capable of transforming into an eager reader. This metamorphosis occurs when tutors, teachers, and parents use the proper tools to assist students through the struggling phase. The most important tool is finding the right book. Make every effort to connect with the student and explore his or her individual interests and passions. Then think about the readability level. Will the student feel comfortable with the text? Or find it too dense or even too babyish? If children—especially boys in the middle grades—think the book looks like something their little brother would read, they are not going to open the cover. And if there's even a hint that the book might be designed for someone with a reading or comprehension problem, and could potentially embarrass the student if his peers see him read it, that book will be dismissed immediately. 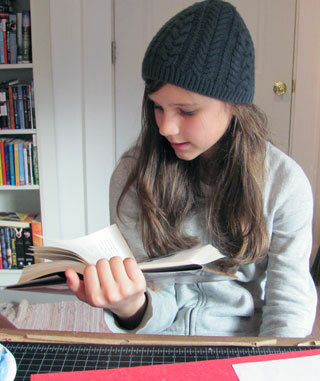 Most reluctant readers really do want to read. In fact, some of them want to read desperately. However, if they don't feel comfortable or are perceived as dumb when they read aloud, they will continue to shy away from reading. Readers need to feel at ease with the material, connect with the characters and feel engaged. 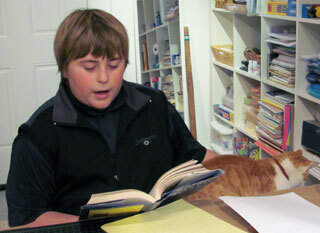 For example, author Rick Riordan's dyslexic son struggled with reading until Riordan wrote The Lightening Thief, which he specifically wrote to help his son with reading. After engaging with Percy, the main character in the series, Riordan's son transformed into a voracious reader and now wants to be a writer. "The best e-mails I get are from teachers and parents saying my books have turned non-reading kids into readers," says Riordan. "That's exactly what happened with my own son. Before Percy, he never read books. Now he's 15, and wants to be a writer!" Finding the right book is essential. The book should be a good size and not a tome. How many children do you know, when introduced to a book inquire, "How long is it?" Don't depend on the back cover to tell you the appropriate age and reading level. The best measure is to read the book yourself. You can also look at websites like Renaissance Learning (www.renlearn.com), which provide reading levels and great synopses of the books. Allow readers to have some control over the books they choose. Together (in a tutoring or family situation) pick out four appropriate books, read aloud the jacket flaps and several pages, then let students choose which book seems the most enticing. If after reading several chapters, the book doesn't feel right, allow them to choose something else. Don't struggle through a book that doesn't completely engage student readers. There may be a time when they can come back to that book and it will feel perfect. Children are interested in checking out books that their friends recommend, so encourage them to try those books, even if they may not be your choice. The primary goal is to choose books students will read, and read enthusiastically. Age-appropriate chapter books with illustrations and/or graphic novels can sometimes be the dangling plum to spur the reader's interest. The Diary of a Wimpy Kid series, by Jeff Kinney, with the quirky and fun illustrations, is the lightening rod for many reluctant readers. The Bone series by Jeff Smith is another favorite, especially for elementary school boys. And elementary school girls love the Baby Mouse series by brother and sister team, Jennifer and Matthew Holm. Whatever gets your reader racing to the bookstore is your literary guidepost. If students are reluctant to read aloud initially, do most of the reading yourself, then introduce a page or two to your reading mates as they begin to feel more comfortable. The Readers Theater series by Evan-More is a helpful tool to engage children in reading aloud, especially with small groups. Make sure your students are comfortable and reading in a peaceful environment, with few distractions. Cheerful surroundings encourage children to relax, enjoy the process, and feel at ease opening up to the reading and to the conversation about the reading. When you are reading the book aloud with students, and sharing the reading, go in-depth and analyze the story. Talk about the characters, compare them to people you know, or other books you have read, and discuss any personal connections students notice. Use a variety of word-solving strategies. If students don't know the word, have them spell it to you, then give them the word. (See article on Spelling Strategies.) Using this process, students focus on the word—say the letters aloud, get the answer, and use their visual memories to connect with and remember the word. Have a conversation about why the author is using certain strategies and literary devices—get to know the author and talk about other books he or she has written. Seeing in the mind is an important ingredient to advance reading fluency. It is also a tremendous attribute for writers. Talk with students about the images they see from various scenes in the book and have them draw, paint, or collage a picture of something that intrigues them. Most students understand and connect with the narrative more once they have an image of the story. 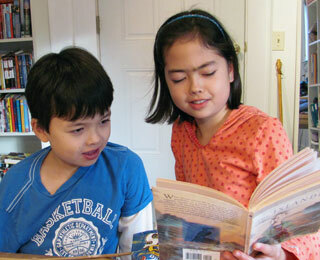 Some students feel that reading fast is the barometer proclaiming they are good readers. Reading fast is not the sign of a good reader. Comprehending the material, getting into the story, understanding the nuances, making predictions, and relating to the story are all signs of good readers. When reading aloud, expression, inflection, rhythm, and tone are more important indicators than reading fast. We've all known students who race through books, but when the time comes to talk about the story, they don't remember anything. It is best to stop after every chapter and review what has happened in the story, especially when reading aloud in teams or literature circles. Do whatever it takes to engage your readers and keep them actively involved. Always encourage the readers in a positive manner, and explain to them in simple terms how reading well takes a lot of practice. Accentuate your students' strengths and don't dwell on their weaknesses. When it comes to learning to read, every child has their own time clock. When a student is ready to read, they will read. With the proper help, support, encouragement, and the right reading materials and strategies, reluctant readers will become eager readers. Here, listed by grade level, are some of our favorite books for reluctant readers. as well as more graphic novel suggestions, and three excellent links for further reading resources. Picture books are good for all ages!